Zadar is a medieval walled city on the Dalmatian Coast of the Adriatic Sea. 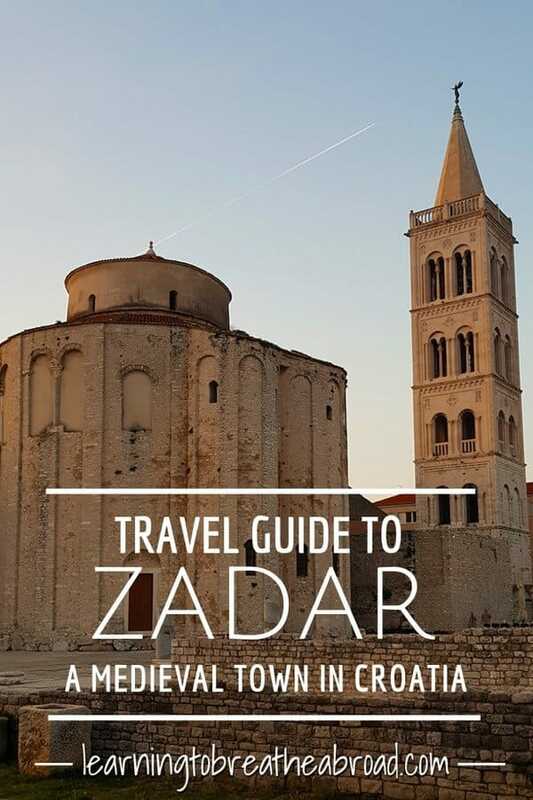 The Old Town may be small, but there are many things to do in Zadar, from Roman ruins to Byzantine churches to a modern seaside promenade with innovative art installations (the Sea Organ and Salute to the Sun). 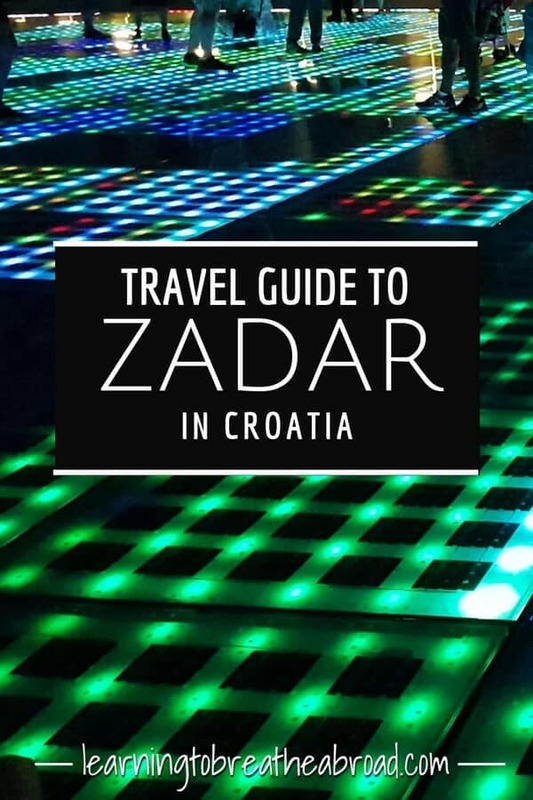 Below you will find our guide to what to do in Zadar and what to see around Zadar. There are also lots of things to do as day trips from Zadar, so make sure to plan for a good few days here. I had managed to find a free parking lot only a few minutes walk from the old town, which made life nice and easy. 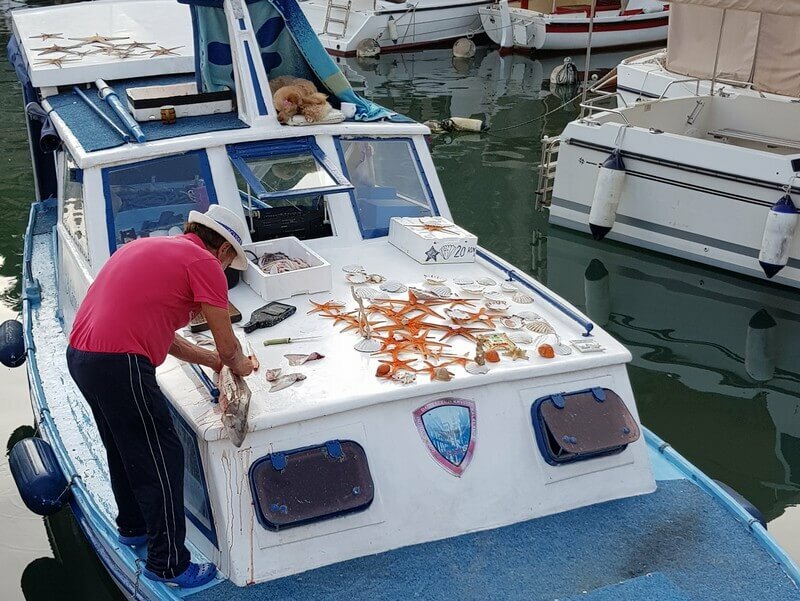 On our way into the old city, we passed by the small Foša harbour where our attention was drawn to a fisherman on the deck of his boat. He was cutting up a small shark, while classical music blared from his stereo and his poodle lay on the top deck under a cover, just like a princess! It was a lovely look at real life in a living Old City. 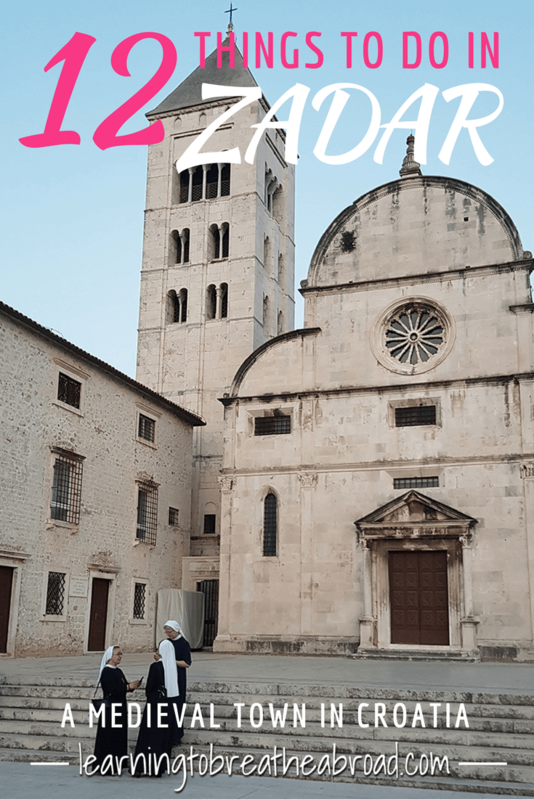 I love exploring the Old Towns and we loved exploring Zadar. We stopped at a bakery for the most humungous pizza slice that was super cheesy and delicious and munched on that while wandering the cobbled alleyways of the town. We sampled the local specialty, Maraschino, a sweet cherry liqueur. We browsed the souvenir stands, popped into the cafes and darted down every side street we could find, wondering where we were going to pop out. 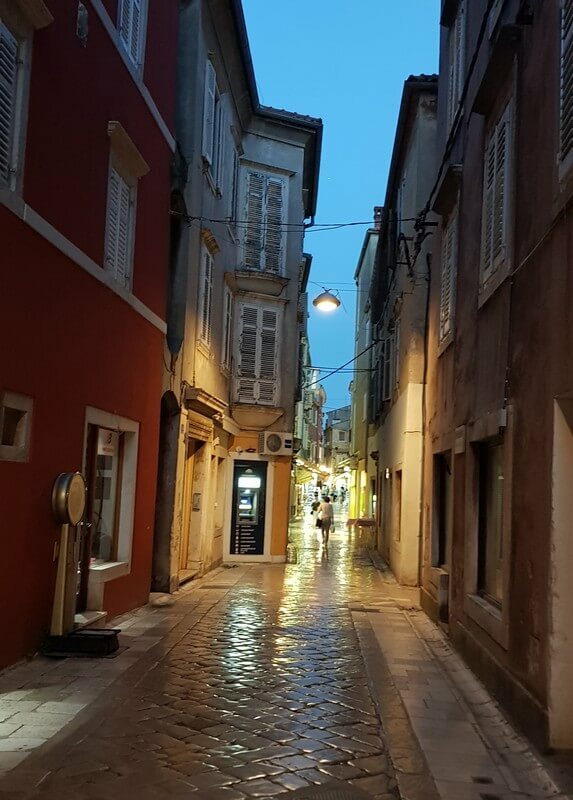 The streets of Zadar Old Town are paved with stone slabs that have been worn by the tread of millions of feet over many centuries, till they gleam and shine. They can also be rather slippery, which Tai realised with much delight. He wasn’t the only child I saw skidding through the alleyways! 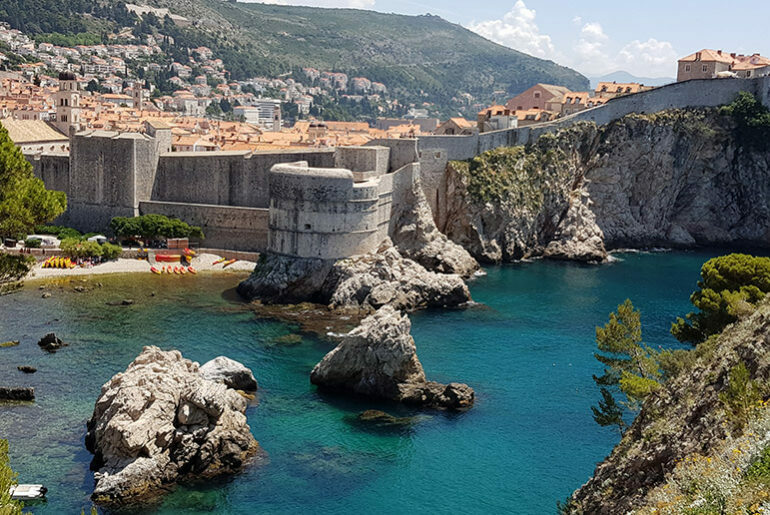 The old city sits on a finger of land surrounded on three sides by the sea with a promenade or riva running the length of the Western sea-side. At the Northern tip, a magical artwork has been created called the Sea Organ. Marble steps have been built right against the sea, with pipes built into the stairs. As the waves lap against the steps, so air is pushed through the pipes and where the air escapes on the promenade, so the sound is created. Created by the Croatian architect Nikola Bašićis, it has a rather haunting and yet surprisingly relaxing melody that can be heard while sitting on the steps. Needless to say, this is a tourist hotspot, so loads of people were all gathered to watch the sunset. You need to get here at least an hour before the sun sets if you’d like a front row seat. I grabbed a beer from the restaurant right behind and we were treated to a magnificent sunset. With the sky glowing red and the gentle tunes floating through the air, there really is no better place to relax and enjoy a moment. Next to the Sea Organ is another art installation called Salute to the Sun. 300 multilayered glass plates soak up the suns energy during the day and then creates an amazing light show in the dark. Wait until it gets dark and then watch as little kids and adults alike run, dance and laugh through the everchanging colors. It makes for a very festive atmosphere and a definite to do if you are traveling with kids. Amazingly, along with the wave energy collected from the nearby Sea Organ, the Salute to the Sun collects enough energy to power the entire seaside lighting system. So not only is it decorative and entertaining but also incredibly functional. The same architect who created the Sea Organ, Nikola Bašićis, also created the Salute to the Sun installations. Built in the 9th Century, St Donatus’Church is the largest Pre-Romanesque building in Croatia and is widely considered to be among the finest examples of Byzantine church architecture. No religious services have been held here for many years, but due to its extraordinary acoustic features, it is now used for musical performances. You can go inside, but it is rather unadorned, so perhaps better to see its majesty from outside. In the cities of the ancient Roman Empire, the main squares were called Forums. 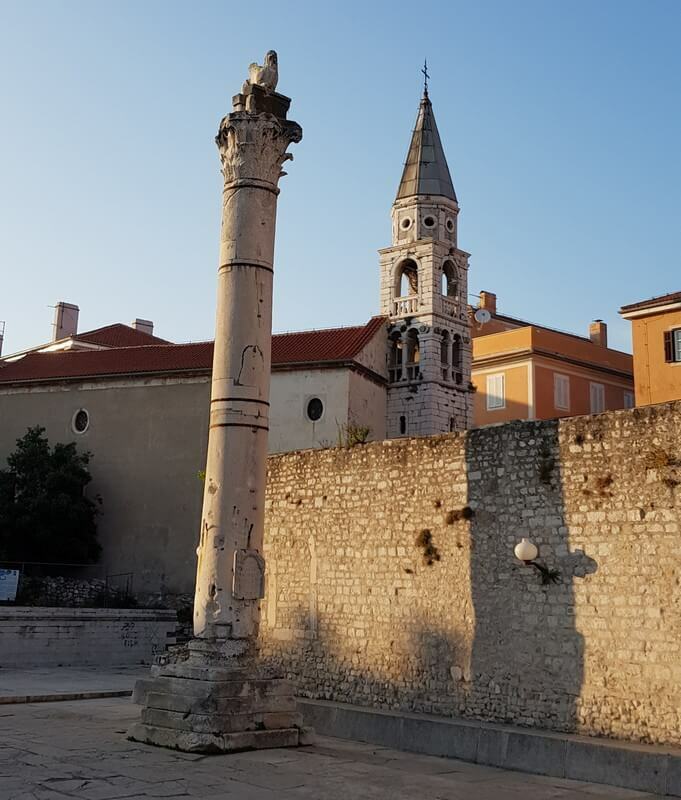 These were the centre of life and religion in the city, as is evident with the Zadar Forum being alongside St Donatus. Built in the 1st century BC to the 3rd century AD, it is the largest forum on the Adriatic. The lone surviving column is actually a Pillar of Shame, used to chain and publicly humiliate those that had done wrong. Wander in amongst the walls of the ruins and see if you can find the alters used for blood sacrifices or see the mythical carved figures of Jupiter, Ammon and Medusa. The Saint Mary’s Church and Benedictine nunnery that was founded in 1066 by Čika, a noblewoman. It can be found opposite Saint Donatus’ Church and the Roman Forum. 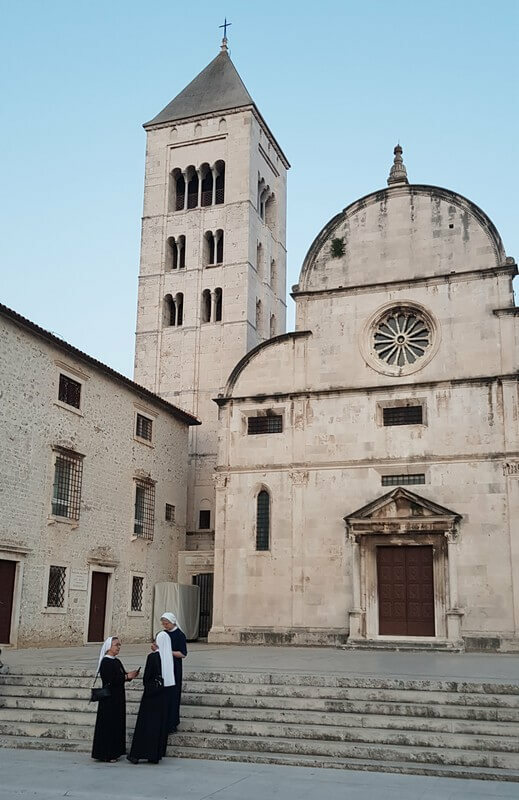 The nuns are responsible for the care of the stunning Treasury next door, known as the Gold and Silver of Zadar. Also known as the People’s Square, this square has been the heart of the city for centuries. The square is flanked on one side by the Town Hall and on the other side by the Romanesque church of St. Lawrence. There is no better place to sit down at a cafe with a delicious coffee while watching the world go by. Our entry into the old town of Zadar was past the little Foša harbour and on through the very impressive Land Gate. Built in 1543 by the Venetians, this Renaissance masterpiece was the main entry into the city and has the characteristic large middle archway for wheeled traffic and the two smaller side arches for pedestrians. The elaborate carvings show St Chrysogonus (Zadar’s patron saint) on horseback and the Venetian winged lion. It sure makes for an impressive entrance. Climb the tower if you dare! Actually, it is not that bad. The steps are steep, but the platform at the top is big and the views of the Old Town and the port are fantastic. 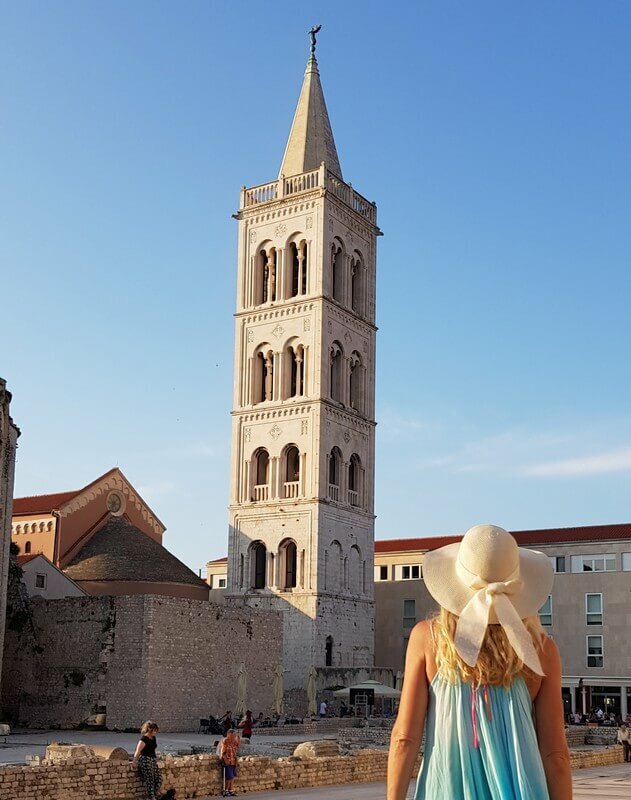 At 56m, the Bell Tower is the tallest structure in Zadar and while part of the Cathedral, it was built as a separate structure. Nin is Croatia’s oldest Royal City making it more than 3000 years old. The Old City can be found on a little island connected to the mainland by two pedestrian bridges. 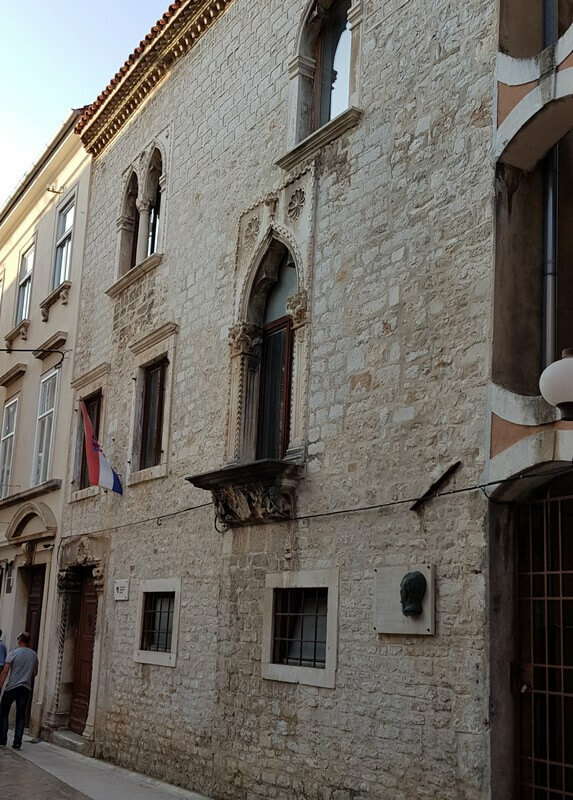 It is the site of the smallest cathedral in the world and the largest Roman Temple on the Adriatic. Have a stroll around the old town, enjoy coffee or a lunch at an al-fresco restaurant or kiss Bishop Gregor’s big toe and see if your wish comes true! Only 15minutes drive away from Zadar, Nin makes for a great day trip either by car or by bus. Nin has not one but six beaches and not pebble beaches either. 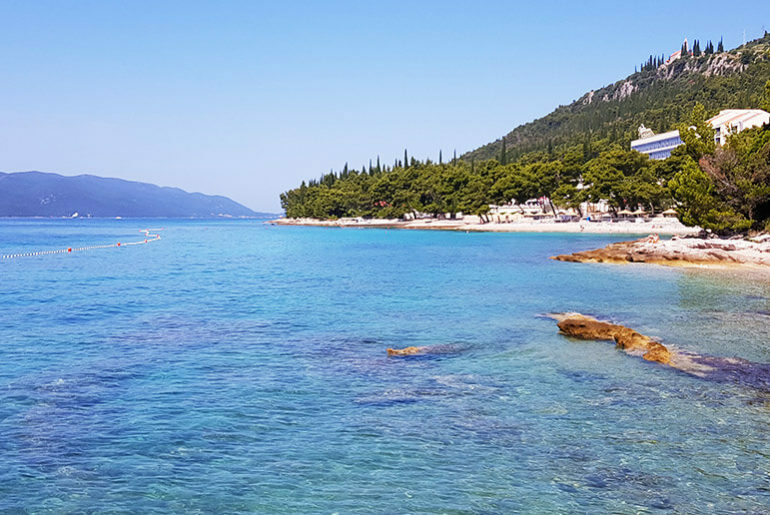 These are gorgeous sandy beaches, with Queens Beach being touted as Croatia’s most beautiful beach! The water is shallow for a long way out which makes this an ideal beach for young kids. Queens beach has even been awarded Blue Flag status for its cleanliness. Behind the beach is a lagoon filled with peliod mud. Find yourself a nice muddy patch and cover yourself in this medicinal goodness. Make sure to keep it on for at least 30 minutes, then run into the sea and scrub it all off. You won’t believe how deliciously soft and smooth your skin will feel. Plitvice Lakes is the most popular tourist attraction in Croatia and for good reason. The lakes are simply spectacular! The crystal clear turquoise green water flows through 16 limestone lakes and cascading over numerous moss-covered waterfalls. This is nature at its best! There are wooden walkways and paths all around the lakes and you can choose from 8 different hiking routes ranging from 2-3 hours to 8hours. The level of ease or difficulty depends on which hike you choose. There is a ferry connecting the lower and upper lakes and a shuttle bus stops at Entrance One, Entrance Two and The furthest point away at the Upper Lakes. Plitvice Lakes are only 155km from Zadar, so an easy drive or you can get a bus which takes 2 hours. Just off the mainland of Zadar, you’ll find hundreds of little islands and islets, making up the Zadar archipelago. Gorgeous beaches, quaint towns and crystal clear blue water, all easily reachable by ferry or catamaran. 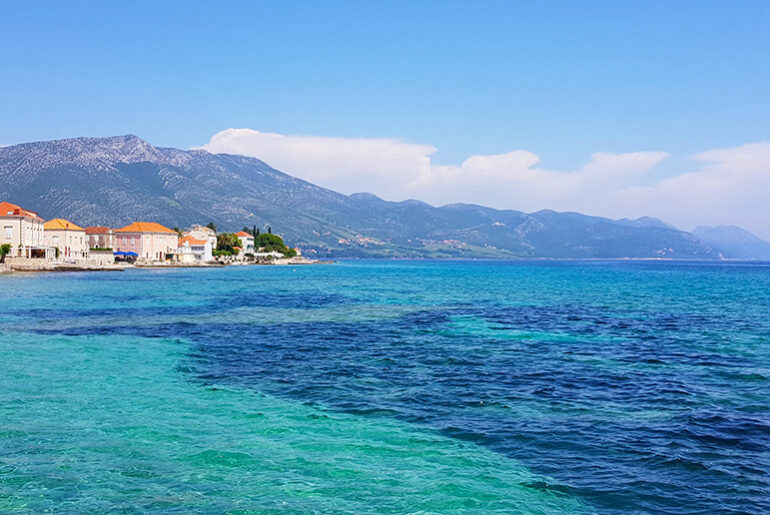 These are a far cry from the bigger and more popular islands off the Dalmatian coast, so these smaller islands are more tranquil and peaceful and perfect for family holidays. Wild Camping: This was a huge parking lot 5 minutes walk from the old town. We wild camped here with no problems. There were a good 8 or 9 other campervans all there overnight as well.